Since there’s so many essential items that new bird owners must buy, we’ve assembled our own bird starter kits to bring them all to you at once! Not only will you have a quality cage for your new feathered friend, but a great selection of bedding, food and hygiene products. 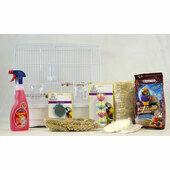 Our bird starter kits feature some of our favourite brands, and are made available at very affordable prices. Whether a new canary or finch is being welcomed into your home or that of a friend’s, these kits are always a good place to start.